Voyance’s National APEX Quality Award recognizes outstanding healthcare organizations that have demonstrated the highest level of excellence in patient satisfaction and overall care. The 2012/2013 winners include ambulatory surgery centers, catheterization laboratories, diagnostic imaging centers, endoscopy centers, hospitals, pain management centers, physician practices, and therapy and rehabilitation centers. It is a privilege to share this honor with so many outstanding providers of care... It is clear that the APEX Quality Award winners demonstrate a passion to exceed patient expectations. Voyance is delighted to announce the healthcare industry’s 2012/2013 APEX Quality Award Winners. This national distinction recognizes outstanding healthcare organizations that demonstrated the highest level of excellence in patient satisfaction and overall care over the preceding 12 months. Winners are determined solely based on patient feedback and a subset of measures tied exclusively to patient care. The 2012/2013 APEX Quality Award recognizes 91 healthcare organizations across eight healthcare markets and 29 states. Thirty-nine of the 91 recipients are first-time winners, while 52 have been recognized in one or more prior years. Twelve facilities have the distinction of being recognized for the fifth consecutive year. New categories were introduced for pain management centers and catheterization labs based on Voyance’s expanding client base. 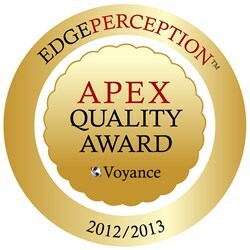 Voyance clients all use EdgePerception™, the industry’s leading patient satisfaction and perception management solution. EdgePerception comes standard with Quality Intelligence™, a built-in feature that promotes quality and process improvement through patient issue resolution. Management groups who oversee multiple locations have access to Voyance’s Leadership Console™, which provides executives the ability to efficiently manage a wealth of benchmarks and feedback for all entities with one solution. The complete list of 2012/2013 APEX Quality Award recipients is listed here alphabetically by market. Voyance offers a wide range of products and solutions that help healthcare organizations improve overall performance. With a client base that spans across nine healthcare markets, all fifty states, and the trusted partnership of many prestigious management groups and consultants, Voyance has helped thousands of providers become top-performers. Our innovative solutions help clients manage external and internal perception, implement quality and process improvement initiatives, and evaluate corporate performance. Voyance is the clinical benchmarking arm of Physician Hospitals of America (PHA) and the Ambulatory Surgery Center Association (ASCA), and is a CMS-approved CAHPS® vendor. Voyance offers a wide range of solutions that can help your healthcare organization improve performance.